A Royal Navy captain's rank insignia during Divisions conducted at HMNB Clyde in January 2013. 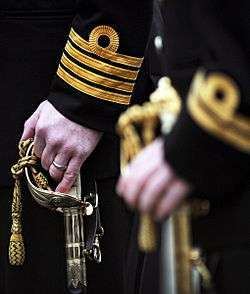 Ashore, the rank of Captain is often verbally described as "Captain RN" to distinguish it from the more junior Army and Royal Marines rank, and in naval contexts, as a "Four Ring Captain" (referring to the uniform lace) to avoid confusion with the title of a seagoing Commanding Officer. In the Ministry of Defence, and in Joint Service establishments, a Captain may be referred to as a "DACOS" (standing for Deputy Assistant Chief of Staff) or an "AH" (Assistant Head), from the usual job title of OF5-ranked individuals who work with civil servants. ↑ "Uniforms and Badges of Rank at Royal Navy website". Archived from the original on 2 August 2008. Retrieved 2 December 2008. ↑ "Naval Book of Reference, Annex 39A: RN Dress Tables" (PDF). Royal Navy. October 2015. Retrieved 5 April 2015.